Phantom Thread, the latest film from auteur Paul Thomas Anderson (Magnolia, There Will be Blood) that once again stars Daniel Day-Lewis (in what may very well be the actor's final on-screen performance, but probably isn't), centers around Day-Lewis's renowned dressmaker, Reynolds Woodcock, and his sister Cyril (Lesley Manville) who are at the center of British fashion in 1950's post-war London as Woodcock designs for royalty, movie stars, heiresses, socialites, debutants and dames alike. The appearance of Alma (Vicky Krieps) in Woodcock's routine then tends to upend every aspect of his life in slow, methodical, and often times even conniving ways. This is an odd movie, but it wouldn't be a Paul Thomas Anderson movie if it wasn't mostly off-kilter and if it didn't go into the numerous layers of meaning and substance coated in what is a seemingly simple and straightforward narrative. 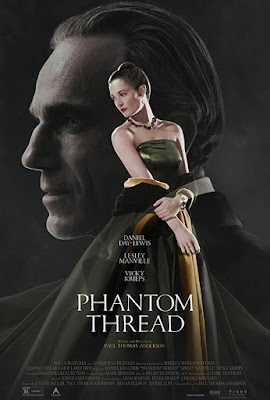 This short summary is more or less what the plot of Phantom Thread entails, but Phantom Thread of course concerns itself with more than just the toppling of the structure that is Woodcock's life made relevant by the appearance of Alma, but more it is about the inner-dynamics of a relationship, the give and take that is necessary if even able to bring one's self to compromise in such a way. This is a question the film and Woodcock ponder endlessly as our protagonist is someone who seemingly knows what he wants and what he expects out of himself in his life and by living according to that standard never lets himself down and fulfills each of his expectations. This lifestyle also allows for his focus to lie solely on what he desires and to not be distracted by the passions or interests of another. In essence, Phantom Thread is about that struggle that naturally takes place in all of us that pulls between what society and tradition tell us we should want out of life that can often times be opposed by our more personal desires and ambitions. That is, of course, unless your sole desire in life is to find a mate and pro-create. It is true that often times our ambitions and desires remain a certain degree of selfish in that to solely give them their due would result in a life of satisfaction and maybe even one of great legacy, but one that lacks a certain meaning while fully giving over to what we're naturally pulled to accomplish in life leaves a greater sense of meaning if not as grand a legacy as one might have imagined for themselves. Either way, the meaning is what the individual makes of it and Phantom Thread is the journey of Woodcock having to learn that balance for the first time in his life as Alma is apparently the first in a long line of muses that challenges the meticulous and powerful mentality that Woodcock has effortlessly exuded over those in his life up to this point. Designer Reynolds Woodcock (Daniel Day-Lewis) and his sister Cyril (Lesley Manville) run a successful fashion line in 1950's London. Photo by Laurie Sparham - © 2017 Focus Features, LLC. 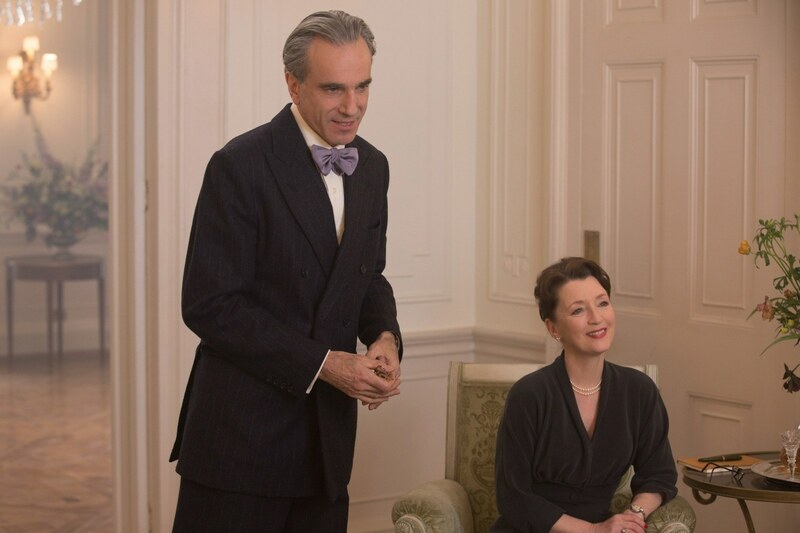 The canvas on which Anderson paints in this instance is maybe the most interesting facet of Phantom Thread as what Anderson is looking to discuss draws no obvious correlations to the fashion scene of 1950's London, but this is part of what makes the film ultimately so fascinating. The players and their personalities are established rather immediately-at least the sense of who they are and what their ultimate happiness or place of peace is, but the direction in which these personalities will take the film is largely up in the air and therefore what makes that different aspects painted across the canvas all the more enticing. That said, Anderson is exploring a lot of themes and unpacking a lot of stuff in the process of Phantom Thread that are done in such subtle and slight fashions for the majority of the runtime that it's hard not to roll your eyes a little bit. That is to say that this is something of an indulgent movie. Not that what it is attempting to tackle isn't tangible and real because the more specific it becomes the more precisely it will hit individual viewers, but as much as it may seem to be it is not the pretentious or conceited slog it might seem is implied. No, Phantom Thread is inherently about a pretentious person, but the film itself is deconstructing what makes this man tick and what makes this woman who desires to care for him and love him feel the way she does. Furthermore, it then addresses the assuredness of this pretentious protagonist because he would typically stand to put his new muse in her place by letting her know in obscenely dismissive ways that as much as she feels she may need him and want him that his life will go on perfectly and as planned without her. He doesn't need her. This mentality, this personality even-has conditioned both Woodcock and Cyril (a Saint in her own right) to be set in ways they are comfortable with to the point their routine is disrupted even at the sound of Alma's buttering her toast too loudly at breakfast. That Alma positions herself as more of a constant than any muse that has come before her is already altering the expectations of Woodcock as well as in Cyril, but the two come to adapt (or not adapt) in very different ways. It's clear that though these two have grown up together and are very much aware of one another's tendencies that they are not the same type of person and to see these paths diverge when the fork in the road that is Alma appears may not be the main point the film stays focused on as it progresses, but is certainly utilized to compliment the evolving dynamic between Woodcock and Alma. More, it highlights the wonderful performance from Manville who, as much as Krieps goes toe to toe with Day-Lewis, plays Woodcock's equal the majority of the time if not becoming this matriarchal figure Woodcock needs in times when the man assumes his worth outweighs others. Playing what could be figures the audience already feels it knows such as the tortured artist or the muse, Phantom Thread quickly overcomes such presumptions by way of Anderson's unique approach to story and the way his conflicts unfold. To step back from the film for a moment and inspect it from something of a more personal standpoint, my mother's side of the family-meaning her mom, my Nanny, and her parents as well as all five of her brothers-were British. I lived in England for a few years near the beginning of my life prior to moving back to the U.S., but my Nanny still resided near us, five minutes down the road in fact. That British influence never wavered and continues today through my own mom who returns every couple of years to England to visit her cousins and extended family and friends that remain there as her mother was the only one to ever leave with my grandfather. Near the very beginning of Phantom Thread as the seamstresses file into Woodcock's building for their shifts there is a shot where two of them assist our protagonist in dressing Gina McKee's Countess Henrietta Harding and the age, the haircut, and style of one of these seamstresses glasses allowed her to look shockingly similar to a picture of my Nanny's mother that is my only reference to who this woman was. Suddenly, there she was; moving around the screen and operating in society in the years she would have been alive and potentially in a role similar to what she might have done on a day to day basis. Not only did this open up the idea of who this lady might have been other than a picture in my grandparent's house, but it provided genuine insight into how detailed every aspect of this world Anderson and his team re-created for this film. It is to this point that, while Anderson's ability and desire to explore basic human emotions through even more interesting and unexpected avenues is the main objective of his creating art in the form of feature films, there is a joy and a dedication outside of the story elements that make the whole of the experience of watching a Paul Thomas Anderson film all the more enthralling. As if the set were a sacred temple, the costumes the fabric of the characters as much as they are their outer layer, and the performers a conduit not only for the words Anderson has impressed upon the page, but individuals in their own right who might bring their own presence and persuasions to these interactions, small conflicts, and the push and pull that helps them to chip away at their characters as the narrative progresses. In other words, it is clear how much Anderson loves making movies and the idea of making movies and what they can possess or represent in a defined package the multitude of feelings and ideas that might spring about at certain stages in our lives and development. It is an interesting, dare I say even fascinating, way in which to approach the viewing of a movie as well, but the approach to the craft that is apparent in the presentation of Anderson's films is something that cannot be ignored. This isn't because the techniques or choices are obvious or take one out of the story being told either, but more they are so unique and personal it is impossible not to notice them. This is more evident than ever in the way in which Anderson continuously unravels layers of his characters and who they are as the film goes on in ways that serve Phantom Thread the same way an action sequence or obvious dramatic sequence might serve a different kind of film. Alma (Vicky Krieps) is the latest in a line of Woodcock's muses who looks to change his rigid routine. It is this type of storytelling that might lead one to determine that Phantom Thread is rather boring or contains no plot in the traditional sense and while I found myself checking the clock on my phone a time or two throughout the course of the film this was more out of curiosity as to what point in the film we were or should be at and how much time Anderson had left to let unfold what he wanted to say. Any film that elicits the questions and thoughts about such precise feelings and moments of interaction between yourself and other human beings that makes rise for bigger questions about who we are in nature and why we are that way and on and on though, is certainly not a boring movie as it is the opposite of an empty chronicling of events. Phantom Thread is a meditative character study where one's reaction to the material will largely depend on whose perspective you see the events of the film from, either Woodcock's or Alma's. That is, until the last ten or so minutes of the film when it becomes apparent that the two have found the right measure of one another in each other's lives. It may all initially feel like executing so much to say something so exact and finite, but with such exactness comes a greater sense of substance and understanding. Phantom Thread does this in an exceptional fashion as I can't help but to want to watch it again as soon as possible to discover things I might have missed on my first viewing. It is a film that will initially leave you bewildered, unsure of how to feel or what there is to say in response to it, but as it settles the movie resonates in countless ways; venturing down avenues one might not have even been aware it dipped into. There is no need for me to tell you how great Day-Lewis is in his role of Reynolds Woodcock or how committed he was to the role of this fastidious fashion designer. There is no need for me to echo the praise of Jonny Greenwood's elegant and intimidating score that lingers over what feels like nearly every frame of the movie or how Anderson's cinematography seems to expose every caveat of the facade by lingering on the cracks and crevices of the human body that we cover with beautiful fabrics, but this is all part of the package and it is all as great as one may have heard or expect it to be based on reputation and/or previous credentials alone. Day-Lewis is undoubtedly the lead in the film and his presence is intoxicating as his face feels consistently ripe as if wearing the freshest coat of oils and lotions while the close-ups on the worn skin at the tips of his fingers as he pieces together dresses hint at the cracks to come in his strong facade. That he has fantastic hair and his face is as sharp as ever with its condescending arches-in his eyebrows, his mouth, and all only emphasize how transformative the actor is in every role. All of this is true, no question, but Manville and Krieps are the real stars of the piece. Krieps crafting Alma over the course of the narrative into someone who wants to get to know Woodcock in a way no one else ever has and in turn not only become a preserver of the Woodcock legacy, but a person, a presence he must rely on. Someone he needs in that delicate routine and that he wants to be a part of his time.